If you’re focused on delivering the best results, you need the hardest working ride in the business. That’s Kubota’s impressive RTV X-Series utility vehicles with the strength, all-terrain ability and comfort to help you accomplish more. These well-built workhorses are designed to help landscapers get more done with powerful hydraulic bed lifts, rugged diesel engines and seating for up to four. Experience endless versatility with available PTO and a variety of attachments and upgrades. 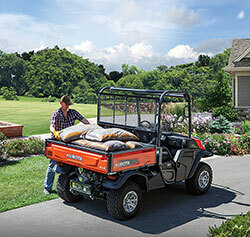 Kubota’s RTV X-Series is sure to help you beat deadlines and exceed expectations job after job. Visit www.KubotaUSA.com to learn more.